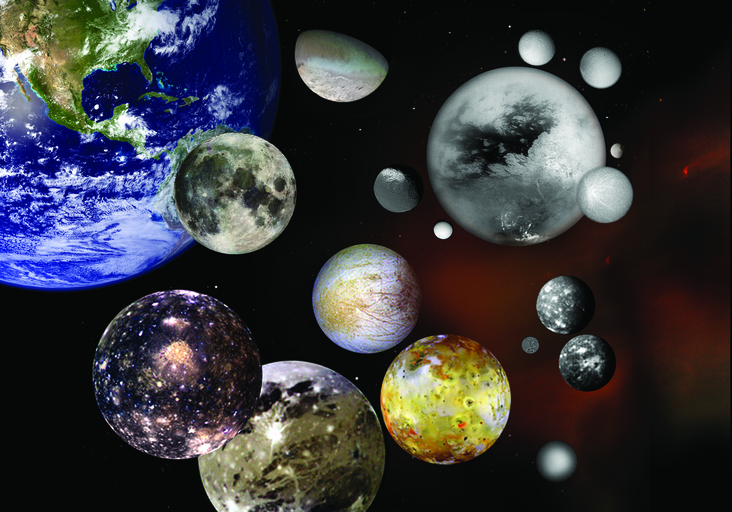 This photo illustration shows selected moons of our solar system at their correct relative sizes to each other and to Earth. Pictured are Earth’s Moon; Jupiter’s Callisto, Ganymede, Io and Europa; Saturn’s Iapetus, Enceladus, Titan, Rhea, Mimas, Dione and Tethys; Neptune’s Triton; Uranus’ Miranda, Titania and Oberon and Pluto’s Charon. Those who name the planets and dwarves try to make the names of their moons relevant to the ancient mythology of Greece and Rome. Some of the figures picked and relationships are strained, but in this portfolio, I intend to explore the relationship between the planets and their main satellites, starting with our former ninth planet, which has been demoted to dwarf status — Pluto.